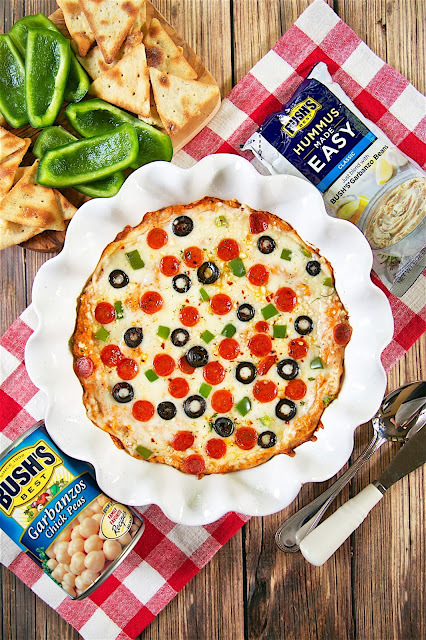 Baked Pizza Hummus Dip - quick homemade pizza hummus topped with mozzarella, parmesan and your favorite pizza toppings. Start with garbanzo beans and a pouch of Bush's Classic Hummus Made Easy, add tomato paste, garlic, Italian Seasoning and parmesan cheese. Bake for 15 minutes. Serve with bell pepper slices and pita chips. 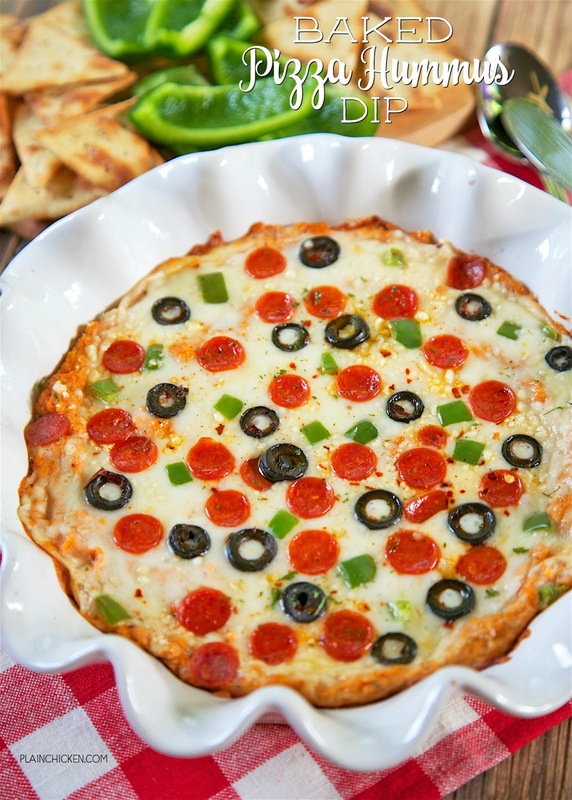 Great for a quick party appetizer or alternative for pizza night! We recently moved into a new house. We love it! We had a few people over to check out the new place, and I wanted to make a few quick snacks. I decided to whip up this Baked Pizza Hummus Dip. It was super easy to make and everyone raved about it! Even professed hummus haters loved it!! 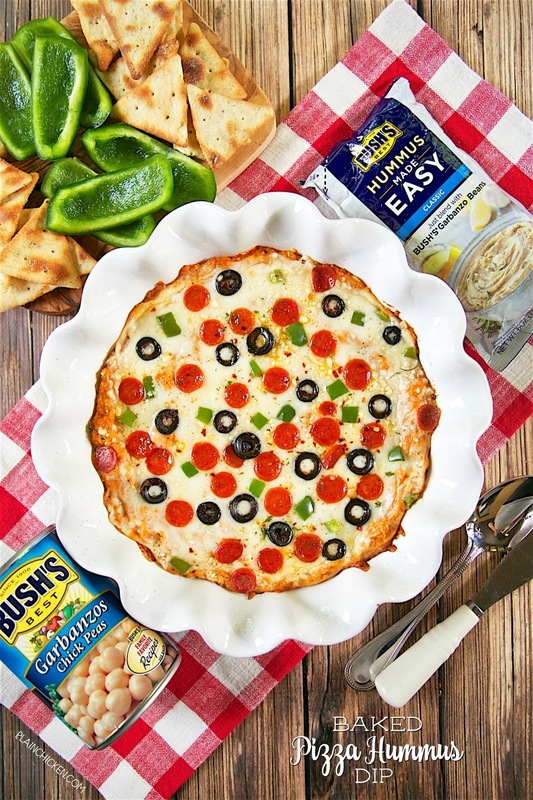 The base of this Baked Pizza Hummus Dip is my secret weapon - BUSH’S® Hummus Made Easy. For this recipe, I used a can of BUSH’S® Garbanzo beans and a pouch of BUSH’S® Classic Hummus Made Easy. I added some tomato paste, Italian seasoning, garlic and Parmesan cheese to the mix and blended it all together in the food processor. I spread the hummus in a pie plate, topped it with mozzarella, more Parmesan and our favorite pizza toppings. I used mini pepperoni, green bell peppers and olives. Feel free to change those toppings up. Onions, mushrooms, ham, sausage, bacon, pineapple - get creative!! There are no wrong toppings. I baked the Pizza Hummus Dip and served it with some bell pepper slices and pita chips. This was the first thing to go! Everyone loved it. 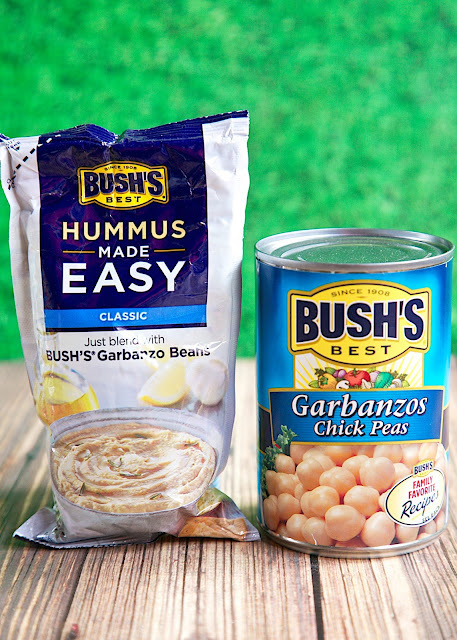 If you haven’t tried BUSH’S® Hummus Made Easy pouches yet, you must do so ASAP. They are located next to BUSH’S® beans at the grocery store. I LOVE how easy they are to customize. I also love that we can have freshly made hummus anytime we want! Perfect for an afternoon snack or a ridiculously easy party appetizer. Combine the BUSH'S Garbanzo beans, BUSH'S Classic Hummus Made Easy, tomato paste, Italian Seasoning, garlic and 2 tbsp. Parmesan cheese to the food processor. Blend until desired consistency. Spread the hummus into the bottom of a 9-inch pie plate. Top with mozzarella cheese and remaining 3 tbsp. Parmesan cheese. 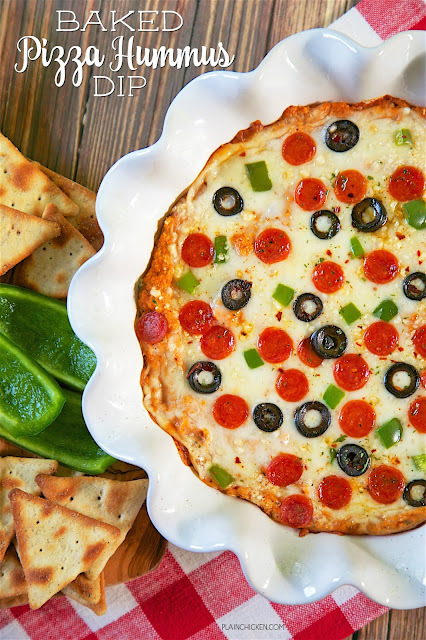 Top the cheese with pepperoni, olives and bell pepper. Bake for 15 to 20 minutes. Serve with bell pepper slices and pita chips. My go-to quick snack is a flour tortilla spread with peanut butter, and sometimes mini chocolate chips, rolled up and cut in half. This travels well if I'm on the go, too. Quick and filling, and who doesn't need a little peanut butter and chocolate in their day?! My favorite go-to snack to have on hand is chips with salsa! Salsa w/ guacamole is my favorite. My favorite quick snack are bananas, little cuties, and cheese sticks. My favorite quick snacks are fruit kabobs. I make them for my kids to eat when they get home from school. Their favorite combination is watermelon, strawberries, banana and cantaloupe. I posted a tweet: https://twitter.com/FireRunner2379/status/765712416680402944. I love chips and salsa. My favorite go to snack recipe is my classic hummus and blue corn chips. I keep a tray of cut-up veggies in my office fridge for all of us to nosh on in the afternoons. I like to keep hummus or greek yogurt dressing for dipping the veggies in, too! My favorite quick snack recipe is pico de gallo with tortilla chips. My favorite quick snack recipe is mashed potato quesadilla. I like Salsa with guacamole. I like to make pizza bagels in the toaster oven. My favorite quick snack is a hard boiled egg or some nuts and a banana. Sliced cheese on wheat crackers. My boys love cheese quesadillas and they're quick and easy. My favorite quick snack is usually grapes and almonds. My favorite quick snack recipe is french onion dip with veggies. My favorite quick snack is popcorn. My favorite quick snack recipe is guacamole toast. Easy and so yummy! My favorite quick snack is grapes and cheese and crackers! If I'm looking for a salty snack I'll break out the guacamole and tortilla chips. For something healthier I like greek yogurt with fresh fruit. I like chips and salsa. I like cheese and crackers or pb&j on crackers. Carrots are also a go to for me. Favorite quick snack - yogurt granola and fruit. My favorite quick snack is cheese and fruit. Popcorn is another one I like. Homemade guacamole is easy and delicious. My favorite quick snack recipe is my famous Fire Hummus, a spicy yet zesty combo Hummus.